Who’s ready for some warmer weather and a fun night out with the girls? 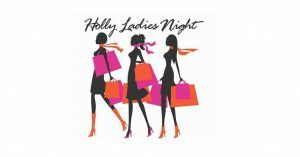 Invite your gal pals to ‘Step Into Spring’ and join you for an evening of sipping, noshing, shopping, and socializing Friday, May 10th in Historic Downtown Holly. We’re going to host such a fabulous night out on the town for all of you lovely ladies! Add this event to your calendar, we cannot wait to see you!